Yesterday, there was a significant far-side explosion on the sun that launched a large CME (Coronal Mass Ejection) – fortunately – along a trajectory that will miss the earth. These events happen fairly regularly on our sun, and while we’ve been pretty lucky the past few decades, scientists know that our luck won’t hold forever. One day we’ll be hit again – as we were in 1859 (see A Carrington Event) – by a massive CME that now, more than ever, has the potential of causing severe disruptions to our world. A CME is the ejection of a massive amount of plasma (electrons and protons & small quantities of helium, oxygen, and iron) from the the sun that may last for hours. Some of this plasma falls back into the sun, but trillions of tons can escape and if aimed in their direction, impact surrounding planets. A CME may arrive on earth – 93 millions miles distant from the sun – anywhere 12 to 72 hours after it is observed, and spark a Geomagnetic Storm. The quicker it arrives, the more powerful it is apt to be. While they pose no direct physical danger to us on the earth’s surface (we are protected by the earths magnetic field and atmosphere), a large CME can wreak havoc with electronics, power generation, and radio communications. While seemingly the stuff of science fiction, the threat is quite real. These assessments indicate that severe geomagnetic storms pose the risk for long-term outages to major portions of the North American grid. While a severe storm is a low-probability event, it has the potential for long-duration catastrophic impacts to the power grid and its affected users. The impacts could persist for multiple years with a potential for significant societal impacts and with economic costs that could be measurable in the several trillion dollars per year range. 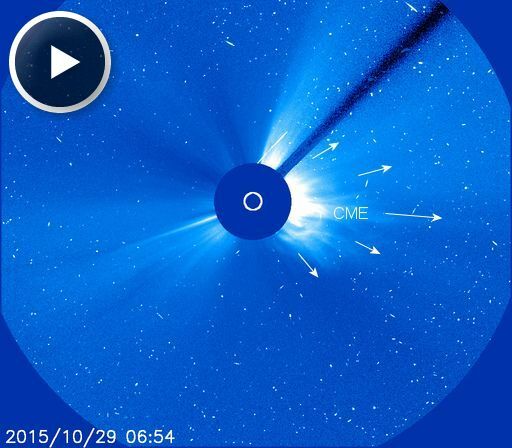 Yesterday the OSTP (Office of Science & Technology Policy) highlighted the risks of space weather, and released enhanced preparedness plans to deal with a direct hit by a major CME, in the following Whitehouse.gov blog. Today, OSTP hosted an event and announced new materials and commitments to enhance national space-weather preparedness. Our Nation’s security, economic vitality, and daily functioning depend on the reliable operations of satellites and aircraft, communications networks, navigation systems, and the electric power grid. As these and other, similar technologies and infrastructures become increasingly ubiquitous and interdependent, the United States – and indeed, the world – faces greater risks from the threats posed by space weather events. A severe solar storm could disrupt the nation’s power grid for months, potentially leading to widespread blackouts. Resulting damage and disruption for such an event could cost more than $1 trillion, with a full recovery time taking months to years, according to the National Academy of Sciences. Today marks a significant advancement towards improving our nation’s preparedness for extreme space weather events. A newly published National Space Weather Strategy identifies high-level priorities and goals for the nation, while an accompanying Action Plan outlines how federal agencies will implement the strategy. These documents were released by the White House’s National Science and Technology Council (NSTC). USGS scientists provide a unique role in exploring space weather by monitoring activity on the Earth’s surface. This work is critical to protecting our nation as the surface where we live and where most of our modern infrastructure is located. The USGS was also one of the key leaders in developing the newly released strategic and action plans and will play an essential role in achieving the outlined goals. Having a response plan is a good first step, but we are a long ways from being ready to deal with this type of threat. Hardening our infrastructure will take years, perhaps decades. I certainly don’t advocate lying awake at night worrying about solar flares (I certainly don’t! ), as it might be decades before we are seriously threatened. But I do believe that we all need to be prepared to deal with a variety of disaster scenarios. The simple truth is, if you are well prepared to deal with an earthquake, pandemic, or a hurricane . . you are automatically in a better position deal with any other disaster, including low probability-high impact events like massive solar storms.